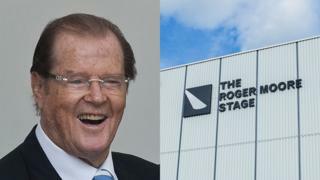 A soundstage named after the late Sir Roger Moore has been opened by the Countess of Wessex at Pinewood Studios. Dame Joan Collins, Sir Michael Caine and Bond producers Michael G Wilson and Barbara Broccoli were among the attendees at Sunday's private event. Lady Moore and the star's three children paid an emotional tribute, saying how proud Sir Roger would be. Sir Roger, who played secret agent James Bond in seven films, died from cancer in May at the age of 89. It would have been his 90th birthday on Saturday. Other guests included Stephen Fry, Sir Tim Rice, Stefanie Powers and David Walliams, representing Unicef. Sir Roger acted in more than 40 productions at Pinewood in Buckinghamshire and also had an office there.